Tom and Tim discuss the 2002 film We Were Soldiers starring Mel Gibson. This film highlights the first major engagement of the US in the Vietnam War. Tim and Tom bring the discussion out of WWII for the first time in show history, and talk about one of their favorite films, Black Hawk Down. Tim and Tom are back, now coving some of our favorite war films. Saving Private Ryan, the first collaboration between Tom Hanks and Steven Spielberg, is the topic of this episode. It’s such a deep and incredibly well done film, we hope you enjoy it as well. Released on Veterans Day 2018 – Many thanks to our veterans for their service! Join Tim and Tom for their discussion of the final episode of HBO’s Band of Brothers. If you’ve enjoyed the series so far, don’t worry, we aren’t going away yet! Dispatches From the Front will continue, covering some of our favorite war films. Tom and Tim discuss Band of Brothers episode 9 – Why We Fight. It’s a deep and meaningful episode you don’t want to miss. Tim and Tom talk about the Battered Bastards of Bastogne in Hageneau, France. Tom and Tim discuss Band of Brothers Episode 6 – Bastogne. The episode covers Christmas of 1944 when Easy Company and the rest of the 101st Airborne were besieged in Bastogne, Belgium, facing cold weather, low supplies, and regular Nazi attacks. Tom and Tim return to cover the Band of Brothers episode, Crossroads, directed by Tom Hanks. This is a unique and meaningful episode in the Band of Brothers series. Also, Tom’s life is about to change… learn how! Welcome back to Dispatches from the Front. Fall in! In this episode, Tom and Tim discuss Band of Brother’s episode 4 – Replacements. 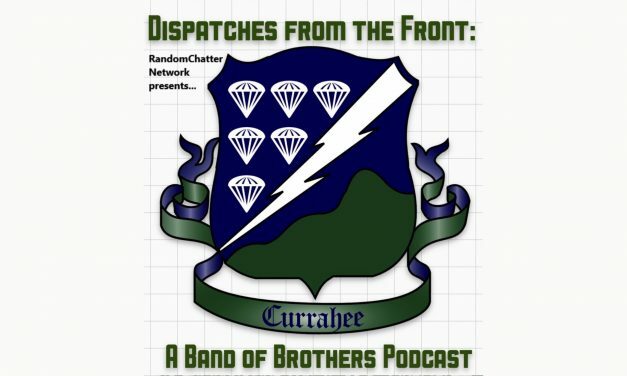 Join Tim and Tom as they discuss Episode 2: Day of Days from HBO’s Band of Brothers series.